In the heart of Provence Verte. In the heart of Provence Verte, this holiday home is ideal for family or friends holidays thanks to its two separate parts which will enable you to spend holidays together while maintaining your privacy. It offers a large enclosed garden with a private pool. The main part is on one level with a large living room, a modern kitchen, a living room with a fireplace and a flat screen TV, 3 bedrooms and a bathroom. 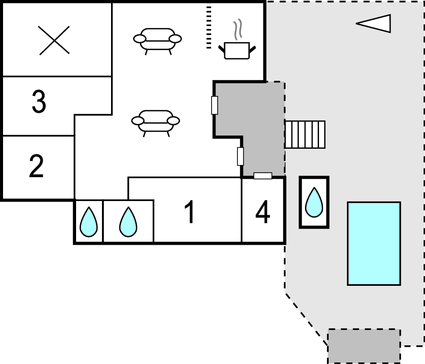 East side, the second part is on two levels with a separate entrance, a kitchen, a living room, and upstairs, a bathroom and two bedrooms, one of which opens to the south on a solarium. You will enjoy large terraces by the pool and a pool house with BBQ. A railway with very little traffic passes by the rear of the property, with no real nuisance. You will be between the Alpilles, the Monts de Vaucluse and the Luberon, in the Gard region and its scrubland, its Regional Natural Park of Camargue, its Pont du Gard and its lovely valley of the Cèze, punctuated by the waterfalls of Sautadet. Do not miss Avignon, which is quite close and whose superbly preserved ramparts contains treasures like the Palace of the Popes, the historic downtown and its ancient streets and the mansions turned into renowned restaurants. You will also be 5 minutes from the road of the Côtes du Rhône to taste the famous Gigondas, Vacqueyras and Chateauneuf du Pape. Worth seeing as well, the perched villages classified as "the most beautiful in France". This solidly constructed modern villa was originally built in 2004 and refurbished in 2014. The agent has rated it as a three star property so it is a well-kept villa, equipped with standard furniture. It is also good value for money. This villa has a swimming pool and is located in Les Angles, only 4km from Avignon. It is set in a good location: there is a restaurant 1.5km away.